The Instagram Explore page is one of the most useful tools available to users. It's also one of the easiest ways to discover new content and, if you use it right, to increase your own follower count. 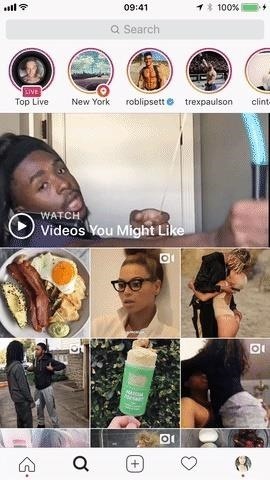 There are a couple ways for you to dominate the Explore page. One way is to long press on a photo until it pops up. After popping up, swipe up to like the photo, view the user's profile, or to send them a direct message. This allows you to view the photo without actually leaving the main Explore page. The other option, a method which I prefer, is to tap on a photo and go to the Explore page's never-ending feed of recommended images. As you scroll through IG's never-ending loop, like each photo as it goes by. Like as many photos as you can until it makes you absolutely nauseous. The same goes for if you prefer to long press and swipe up on the Explore page — at least make sure you like each photo even if it's the worst possible photo in the world. The more photos you like, the more people who will see your IG handle pop up on feeds and elsewhere. The more people who see your account leads to more people who know about you, and the more people who will check you out. I always tell friends who look through my Instagram feed that if they are going to look, they might as well do some work and like each photo as it goes by. It saves me time and also pushes my account further out into the large black hole that is the IG algorithm. It's hard to get on the Explore page, but using it to further along your own platform is exactly what it is supposed to be used for. So try it out and see for yourself. I guarantee you will get at least one new like or follow for every 30 images or so that you double-tap on the Instagram Explore page.